This will be the IG list I'm playing for round one of the ard boyz. I finalized the list AFTER seeing the missions. Having played kill points missions and won despite staggering KP handicaps, I have learned that it is unimportant how many KPs you have. What is important is how many KPs per turn your opponent can collect. MSU still cripples KP stingy armies too quickly for them to kill enough KP per turn in 6 turn games. I'm betting on that fact being true even with 3x as many KP to give up. Now that that is out of the way, I'll explain the deployment of the list. The hydras are deployed first. I'll cherry pick the best spots for them, which will always be the back corners of my deployment zone. Every other hydra will have an infantry squad chimera in front of it, giving the hydras 4+ cover. Also on the back line will be my 6 sentinels, one of each of the pairs will be behind an infantry squad chimera as well, with the lascannon peeking over the tread, giving those models 4+ covers as well. Independently of that gun line formation I'll be placing the command squad and veteran chimeras. They'll be deployed either in response to the threat units, or if going first, in as flexible of a starting location as possible. 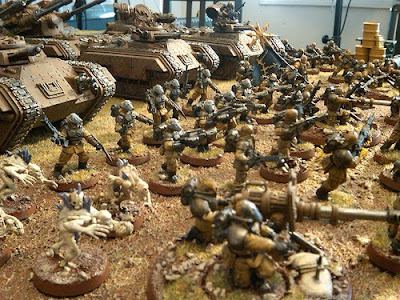 If I face a deep striking army, the infantry squads will start the game outside of their chimeras, and will jog out to create an anti-meltagun net. that move coupled with the fleet officer would make for some sad deep strikers. Also for the popular units that don't happen to have strength 8 CC, the armored sentinels can lock them up permanently. Blood crushers, blood talon dreadnoughts, any non-power fist marine unit, etc. The main concept behind the list will help to explain the absence of vendettas. Rather than screw around with an astropath and with reserving units when not going first against any well built army, I was interested in building a list that just didn't care if they went first or not. In order to do that I needed something incredibly resilient. In my opinion, the best way for IG to gain resiliency is through ridiculous amounts of redundancy rather than plumping for more expensive units. Taking a look at the army after deployment, target priority is very difficult. 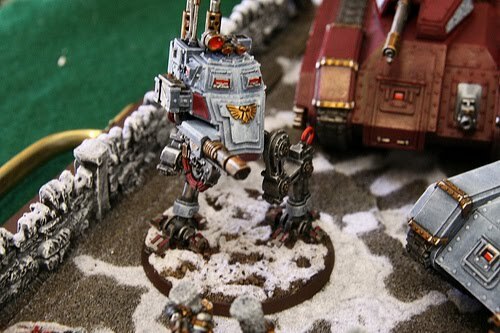 The stuff you really want to kill is in cover, and those first shots into uncovered infantry squad chimeras aren't stopping any of those lascannon shots unless you get a crew shaken/stunned, which will not be what you are looking for. Looks pretty sick. We'll have to check in with him after the first round on Saturday. Thanks Shep! 0 Response to "Army: Imperial Guard for 'Ard Boyz"